About a year ago my wife bought me a rubber wedding ring to wear when I go the gym or camping. At first I was skeptical, but I quickly learned to love it. 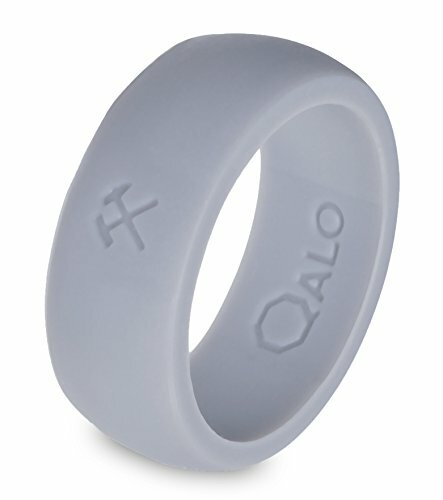 This article will discuss the costs and benefits of using a rubber wedding ring for active men like myself. First I will discuss my wedding ring background. My original wedding band is a black titanium carbide ring. I love the look, the weight, and the fact that I can break it without calling an ambulance. Most rings need to be cut by a special tool paramedics use. I’ve worn this ring for years, and I’ve replaced it twice. Once for cosmetics—it became severely scratched, and the store replaced it for free. And once because I broke it. Long story short, my finger began swelling rapidly from several ant bites and my finger turned blue. Because my ring was titanium carbide I was able to break the ring with vise grips and restore circulation to my finger. All without calling an ambulance. Now to discuss a ring that comes with even fewer hazards. Rubber wedding rings are very different from any other wedding bands I have seen. They sell for $10-$30 and look different than metal rings. They do not shine, and are easily identified. If you choose a size too large, they will fall off. If you choose a size that is just a tiny bit too large, it can get caught and twist off. Because it’s not rigid, they tend to flex and fall off your finger. If the ring is too small, you can still wear it, but you’ll get a small case of trench foot all the way around your finger. Again, because its form fitting. Size is critical with rubber wedding rings. The benefits of a rubber wedding ring far outweigh the costs. These rings are typically marketed towards active people because they are great for doing things with your hands. If you’re in the gym and throwing a bar around, you don’t have to worry about scratching your wedding band. And that metal ring twisting under the weight of your body during pull-ups can give you a severe blister. My favorite benefit is its price. I’ll still wear my original wedding band to church or out to dinner, but I always wear my rubber wedding ring out camping, hunting, fishing, working on the car, and doing yard work, because if I lose it, it only costs $25 to replace. I would much rather risk losing a rubber ring off a boat while fishing. From a safety perspective, I’ve heard horror stories from men who work in warehouses who have known someone to lose their finger because that person fell from a ladder and had their wedding ring snag on a nail, suspending his whole body weight on one finger. This is definitely not a concern with a rubber ring. Finally, my wife loves them because they are customizable. They come in several colors and sizes. I’ve maintained my standard black rubber wedding ring, but she has a red one for the gym and a pink one for dressing up. If you’re a person who likes to accessorize or had a tough time deciding on your original wedding ring, then rubber wedding rings will grant you that flexibility to change. I think that rubber wedding rings are a great product, but they probably are not for everyone. They give you security by giving you the option to wear a cheaper alternative while fishing or camping. They can be more comfortable than a traditional ring in the gym. And they give your wife more peace of mind because you’ll wear a rubber ring during those activities which you previously had to remove your traditional ring.